Question: What is class Constants? You can define constant as string OR expression within the class. but you can not define class as variable, or function. Question: When will Autoloading function will be called once defined? a) spl_autoload_register (autoload) will called when create object of class. b) spl_autoload_register will called when extend by any class (using extends). c) spl_autoload_register will called when implements an interface (using implements ). Question: What is visibility? What are different type of visibility in class? visibility means setting the access level of data member and member function. Class methods must be declare as public, protected or private. Question: What is Static Keyword? Declaring class property or methods as static makes them accessible without needing an instantiation of the class. $this is not available inside the function. Question: Tell me about Abstraction in PHP? Classes defined as abstract may not be instantiated. Class that contains at least one abstract method must also be abstract. When inheriting from an abstract class, all methods marked abstract in the parent's class declaration must be defined by the child. if the abstract method is defined as protected, the function implementation must be defined as either protected or public, but not private. Question: Tell me about Interface in PHP? We use "interface" keyword to create class. To implement an interface, the implements operator is used. Question: Tell me about Traits in PHP? We can use one trait from another using "use"
Question: Tell me about Anonymous classes? 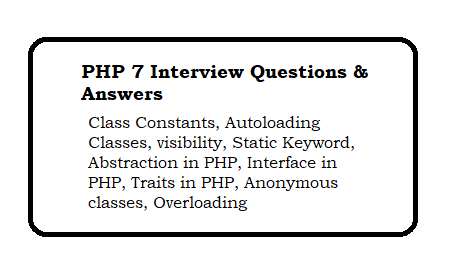 Question: What is Overloading in PHP? Overloading in PHP provides means to dynamically create properties and methods. These dynamic entities are processed via magic methods one can establish in a class for various action types.